Cognitive therapy is one of the most widely used approaches within counselling and psychotherapy today. As such, there is a wealth of literature on offer to the newcomer, which can sometimes be overwhelming for those seeking an initial understanding of the approach. Cognitive Therapy in a Nutshell solves this problem by providing the key elements of cognitive therapy theory and practice in a very concise and accessible way. Cognitive therapy teaches clients that there is always more than one way of seeing events, and therefore that their viewpoint is largely a matter of choice. Helping clients to develop and maintain more helpful viewpoints in tackling their problems is the focus of the therapy. Cognitive Therapy in a Nutshell offers clear explanations of the fundamental models used to treat clients including the information-processing model, and the three cognitive levels examined during therapy - automatic thoughts, underlying assumptions/rules, and core beliefs (schemas). The authors also provide a valuable case study of a client with a social phobia to demonstrate how cognitive therapy works in action. 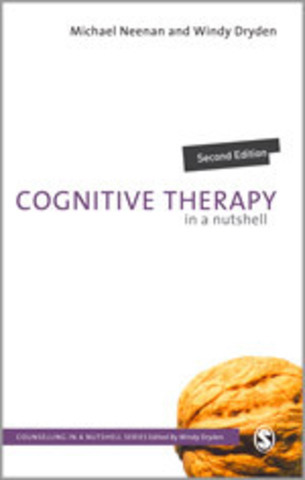 This book will be invaluable to those coming to cognitive therapy for the first time, and who want to gain a full understanding of the basics of the approach.